Not everyone is lucky enough to work from home, instead, it’s a luxury that far too few get to enjoy. However, if you do have the chance to work from home and build your own home office, you might as well make the most of it! The possibilities of what you can design really are endless, and you can craft an environment perfectly suited to your tastes. To start with, let’s take a look at the practical features your home office should include. What essential features should your home office have? Don’t bury yourself away in a dark corner of your home. Instead, make your office space bright and vibrant by making use of natural lighting. Have a large window on one wall, ideally the one that offers nice views. Natural lighting offers a whole host of benefits to those in an office workspace, including a boost in productivity. Being in a cramped work environment is not conducive to productivity, or your health. Instead, make sure your home office includes plenty of space for all your furniture, and also for you to walk around from time to time and stretch your legs. No matter what your job, you’re going to need power sockets in your new home office. Think strategically early on about how furniture will be arranged and then make sure you have enough sockets to power all of your appliances. When it’s dark outside, you’re going to need to make use of artificial lighting, so include some good quality energy-efficient ceiling lights. Also, think about including a desk lamp to help highlight what you are working on close up. Everyone needs warmth, so make sure your new home office is well insulated and there is a radiator for the colder months. If you get cold in your new office, then productivity will fall massively and the whole endeavour would have failed. Think carefully about what your needs will be and then invest in good quality furniture for your office. You should only have to buy these items once and then they’ll get used all day every day, so don’t skimp. Also, think about practicality, such as how big should your desk be? Do you need drawers? What sort of chair would work best? Now it’s time to mix things up. As we mentioned earlier, building your own home office is an exciting time. So, if you can afford a few added extras, then go for it! Build a space you know you’ll love now and well into the future as well. Remember that natural lighting we spoke about? Well, there’s no better way to brighten up your space than by including a large ceiling window. Will you be holding any sort of client meetings from your home office? If so, go above and beyond to make it a space to impress. You can choose luxurious light fittings and a large mahogany desk. Just make sure the room itself has ample space and won’t appear cramped and cluttered. Regardless of your job, books are still a vital source of information. So, why not go ahead and build in your own private library. It should fill from floor to ceiling, and you can even include a roller ladder to be really extravagant. Rather than having to keep sharing the bathroom with the rest of the house, look to include your own private ensuite. It will minimise your need to leave the office and also mean you have your own clean, private space away from other users. No great home office would be complete without tea and coffee facilities and a space for snacks. If you have the room, consider making your own small designated kitchen area, complete with sink, fridge and cupboards for plates and cups. Your home office should be a space for you to maximise productivity and let your ideas run wild. By having a brainstorming wall, you have a whole wall dedicated to plotting ideas and thoughts and seeing what you come up with. When the weather’s nice in the summer months, there’s no better place to work than in the sun. If you have room for a private balcony, then consider building one. You could always build in large patio doors on one wall. That way, you can simply open them up and move your desk closer to this space in order to work with a view. Let’s face it, work can be tiring! So, if you’ve got the space, why not throw in a daybed? If it’s been a particularly gruelling morning, you could always grab a quick half hour nap after lunch to recharge your batteries. Helping to build your ideal home office is often times easier with a little bit of inspiration. 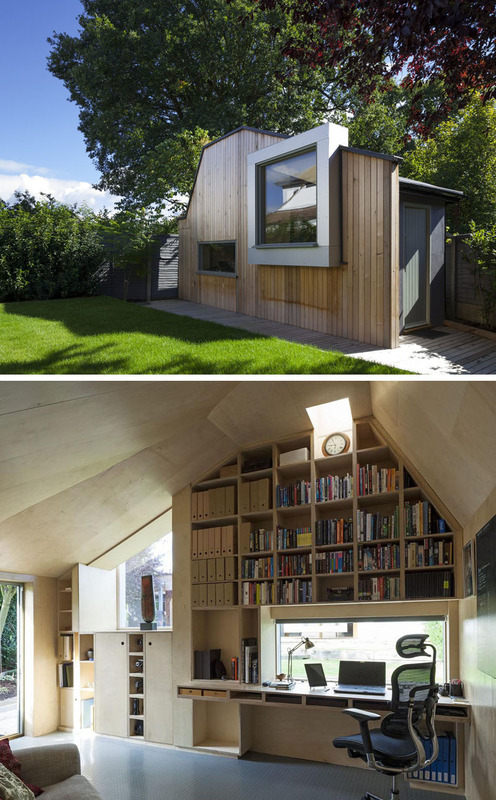 So, to help get your creativity flowing, here are 5 of our favourite home office designs. 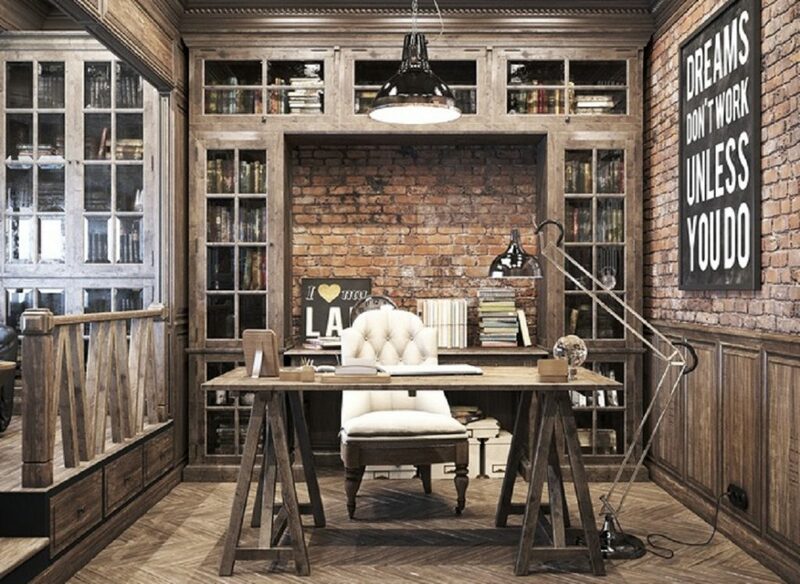 Check out this vintage home office space! The designers have blended dark woods and red brick, and then added in some vintage furniture. All in all, it makes for an old-school workspace that is set to impress any clients who come to visit. The large window on the back wall floods the room with natural light, and the high ceiling creates a sense of space and energy. 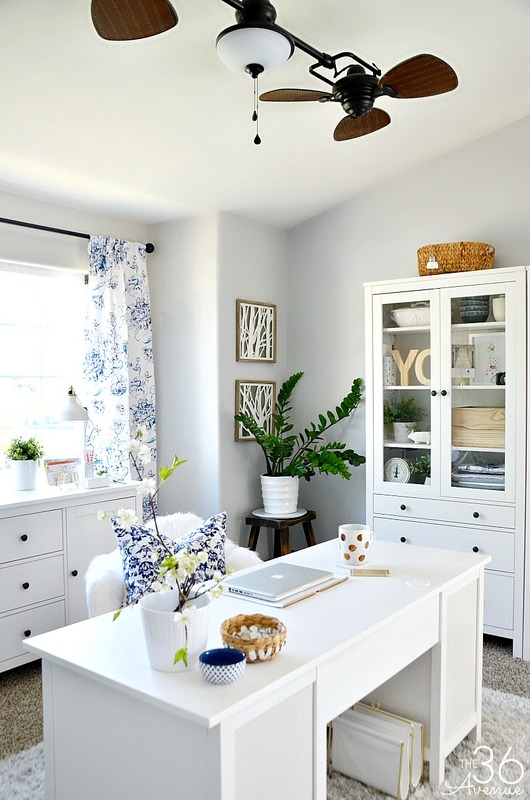 This wonderful home office design has a very feminine feel to it and makes for an incredibly welcoming workspace. The large window behind the desk floods the room with natural light and all of the light colour schemes blend nicely together to give the room life. Once again, there is plenty of space as the room is large and has nice tall ceilings. 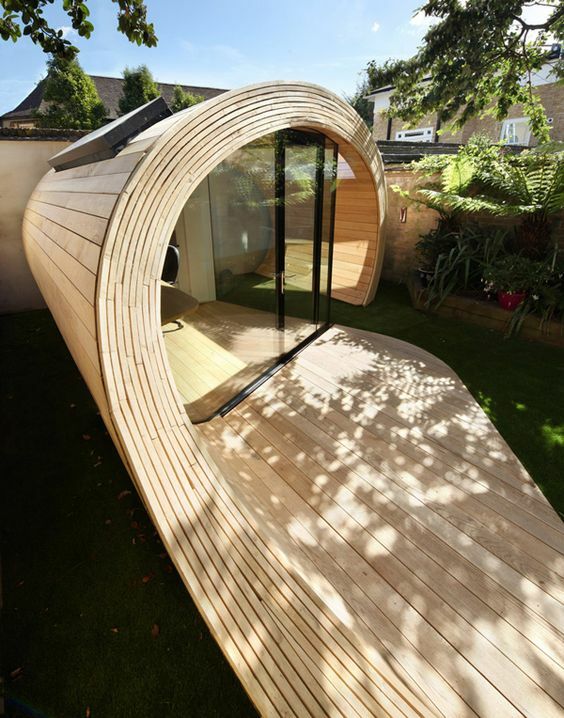 If you have the space to build your own home office in the garden, then why not go for a wooden pod. They can be designed to suit most spaces and can be fully fitted with all the amenities of a brick and mortar building. This one is wonderful as it has a complete glass front with a porch area you can sit out on and enjoy when the weather’s nice. Or for something more spacious and modern, check out this custom built home office. The white interior, glass front and high ceilings give a sense of spaciousness you’d struggle to get in a standard home office. There’s also plenty of room for any additional features, such as bookshelves and additional seating. Again, there’s also space to enjoy the warm summer months working outside. This has to be one of the best examples of quirky home office architecture. From the outside, the building is a mismatch of shapes and blend of different materials. On the inside, it is large, spacious and has an entirely unique layout. By fitting a large bookshelf above the desk, it frees up the rest of the room with space to move around. You’re going to be sitting at your desk for long hours of the day. So, make sure you choose a comfy, ergonomic chair and desk that is well suited to your height. Here’s some more info on ergonomics for your home office. Because you’re working from home, it’s your responsibility to keep your space clean and organised. From the start, you should create a way to tuck away all trailing wire and cables in an orderly way underneath your desk. The best way to keep your home office tidy is to consider how everything will fit and be organised whilst you are in the initial design process. Think how appealing your home office will be all year round. 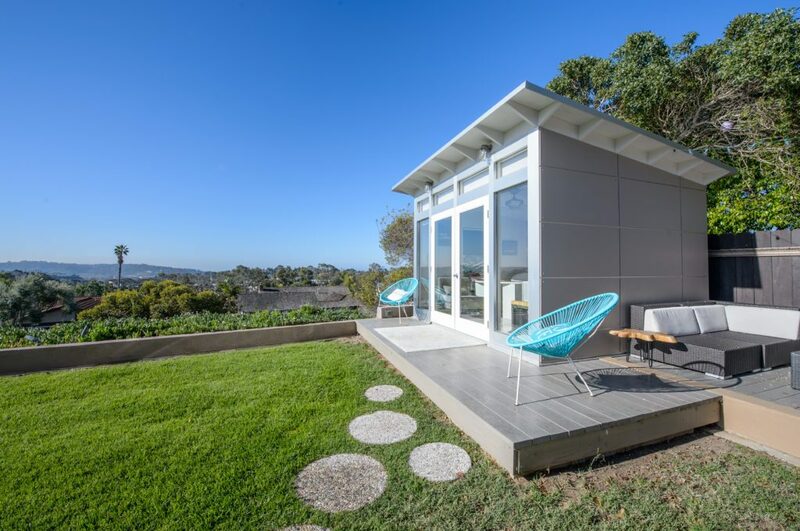 From the examples above, it’s clear that the best home offices are those that have outdoor space that allows you to make the most of the warmer months. The best way to achieve this is to find a way to build a small home office somewhere else on your land away from your main home. Ultimately, the key to creating the ideal home office is to look at exactly what you need practicality-wise, and then include a few key features that you’ll love personally. Create a space that is unique to you and your tastes and don’t worry too much about what others think. Here at Butterley Barn Interiors we are experts at creating fabulous spaces and helping our clients to turn their visions into reality. Check out our Facebook and Instagram pages for inspirational ideas!